Here is one of many advertisements by McDonald’s for their new line of salads. The billboard acts as a myth because it “is a system of communication” (Barthes 261) for the viewer about the healthiness of McDonald’s. If salads are known to be healthy and McDonald’s is selling salads, then McDonald’s must be healthy! 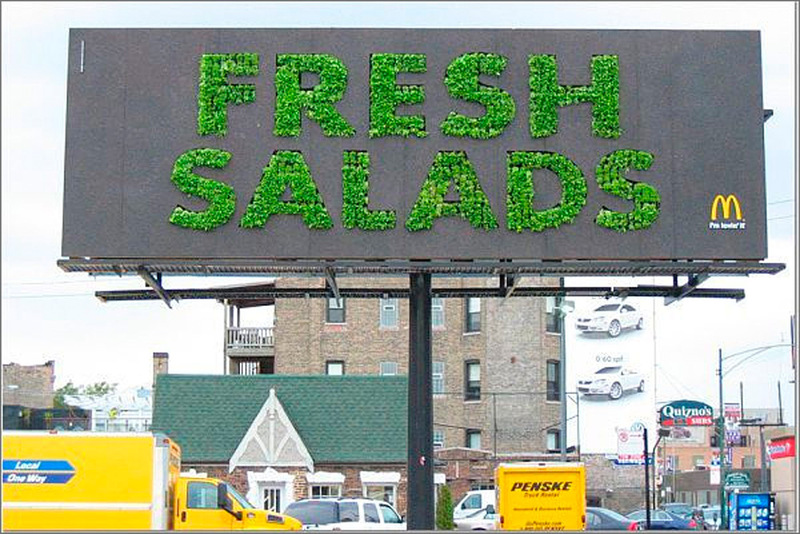 When I first look at the billboard I see the obvious denotations of the words “salad” and “fresh”, as well as the grey/concrete colored background combined with the green lettuce-y looking lettering (I love alliteration). I also see the golden arches symbol in the bottom right corner as well as the phrase “I’m Lovin’ It.” The other observation I see with this photo is the fact that the billboard is placed in an urban environment. When I start putting these connotations together (second level) I start thinking of McDonald’s as an American made business (and an extremely lucrative American business!). I also begin to feel as if McDonald’s is a healthy place where I can get a salad to eat. As a matter of fact I can get a FRESH healthy salad! Combining this good feeling with the knowledge that McDonald’s is an American store supporting American values, we get the sense that being healthy and eating salads at McDonald’s is the American thing to do! And not only are these things good for me, but as an American, I love it! Another major aspect of this photo is the billboard’s placement in an urban setting. The placement of the billboard physically plants McDonald’s into the city. In other words, the city eats McDonald’s. Not only the placement of the billboard, but the billboard itself looks like an urban sidewalk with green springing out of itself. The green “garden” brings life to the city, just as McDonald’s salads bring life to people who eat them. However this is all a myth! We all know (or should know) McDonald’s isn’t a healthy place to eat! Yes you can get a salad but the ingredients in the salad are terrible for you. Even some of the burgers are healthier than salads! Looking at the worst burger and worst salad we see that the Double Quarter Pounder with Cheese has 750 calories and a fried chicken salad has 450 calories. Not really much of a difference. However, this billboard promotes the myth that McDonald’s is good for you by offsetting the fact that the store has unhealthy deep-fried burgers with salads. People see the urban, American salad and think it is automatically healthy. The truth is that the salads are still full of fat (up to 22g of fat in a bowl). In my opinion you might as well get a Big Mac! i love the imagery of mcdonalds being “planted” into the urban sprawl. Its a frightening thought, but a city boy myself, i am faced with the reality that McDonalds is really everywhere. ” And not only are these things good for me, but as an American, I love it!” — and I love this line. I think that taking the first person here actually really makes your argument work, because you, as a consumer, are the one being “hailed” by its message. Apart from the fried food, what else about the spread of McDonald’s makes the myth of freshness false? I’d say the fact that all of their food is prepackaged or frozen before transporting across the country before arriving at the store before being thawed and given to customers then being sold as “fresh” is another indication that the spread is not nearly as “fresh” as they are alluding to.